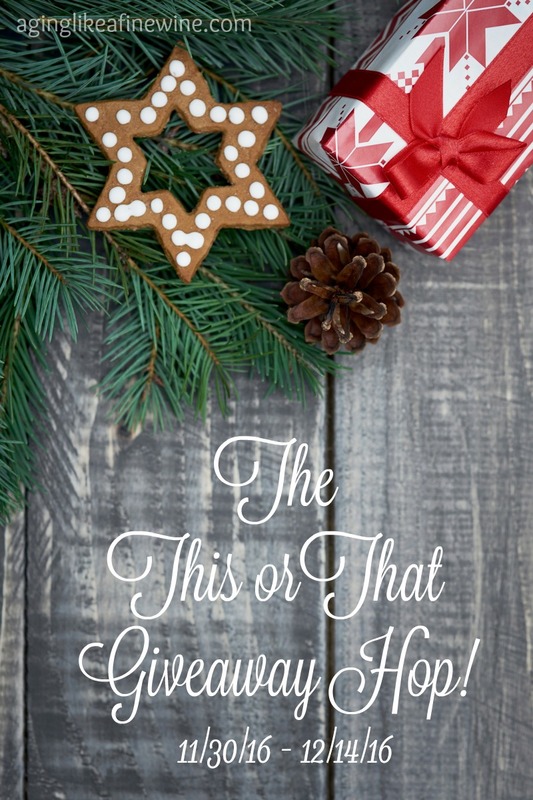 Lots of Blogs and Lots of Giveaways in the “This OR That Giveaway Hop”! I’m one of those ladies that refuses to start putting up any Christmas decorations until after Thanksgiving. So now that Thanksgiving has come and gone, our Christmas tree is up. Plus my little Christmas village is twinkling away and my fairy garden is decked out for Christmas. Not a lot, but we’re on our way! The passing of Thanksgiving also means that Christmas shopping season is in full swing! 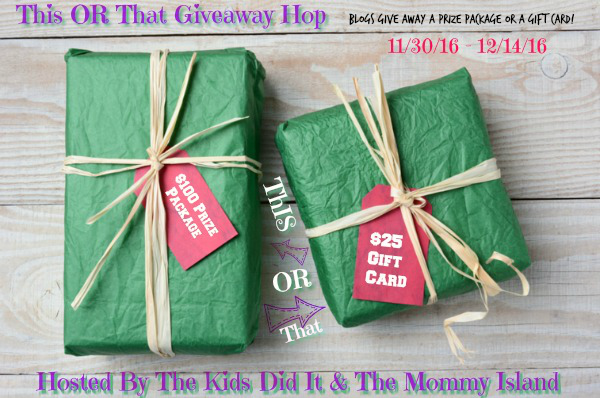 And just in time, the This OR That Giveaway Hop, sponsored by The Mommy Island and The Kids Did It, is here to offer you a chance at lots of super holiday giveaways. 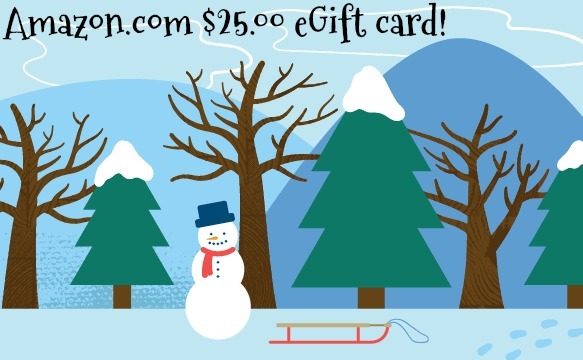 My giveaway is a $25.00 Amazon.com eGift card! Because it’s an eGift card, the winner will be sure to have it in time to spend for Christmas. So enter my giveaway below and then hop around to all of the blogs listed below the entry form. Have a wonderful Christmas! This giveaway will be shared on some of the lovely link parties found on my “Where I Party” page. The best stocking Stuffer I ever received was my engagement ring from my soon to be husband! The best stocking stuffer I have ever received was a $100 gas gift card. Best stocking stuffers are candy. A necklace picked out by my hubby and son!! It was adorable!! A diamond tennis bracelet was the nicest stocking stuffer I ever received. The best stocking stuffer I ever received was my favorite Scharffen Berger chocolate. My favorite stocking stuffer that I received was a gift card. Best stocking stuffer was 4 Christmases ago when I got a $5 lottery ticket and won $50. A copy of Joe Bob Goes to the Drive-In. The best stocking stuffer I’ve received was a plastic necklace that my child bought for me at the school’s holiday fair. The best stocking stuffer I’ve received was a plastic necklace that my child bought for me at the school’s holiday fair. I still have it. Comment and tell us the best stocking stuffer you’ve ever received. clothes,but at the time i hated it..
We will be staying home this Christmas! There will be travel and home time over the holidays, but Christmas Day proper is at home. We will be at home for the holidays. We are very lucky that the majority of our immediate family all live very close!!! I’m fairly new at participating in the giveaways, so I don’t really know what other bloggers reasons are. For me it would be cost because at this time I am purchasing and mailing my own prize packages. Many blogs would be offering items that would be coming direct from the company and I’m guessing the company might be stipulating whether they will mail overseas. I hope this helped. Have a very Merry Christmas! My 27 year old son and I will be spending the holiday at home. My mom is 92 years old and we hope to spend it with her. Actually our first grand child was born this week. So we will be traveling from SC to NY . I have never been so I am super excited! No way! I’ll be staying home for the holidays. No traveling for us this year. We will be staying home. We will be staying home for Christmas and all the kids will be visiting. We will visit family and friends on Christmas this year. I don’t travel during the holidays. All my family lives nearby. WOW! That’s a big list, something for everyone! I’m subscribed to your blog since you’re a grandmother. 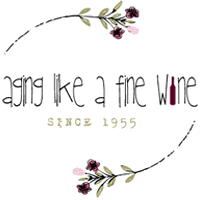 All of us grandmothers have to huddle together, you know 🙂 Since you party a lot, drop over to our Blogging Grandmothers Link Party, we’d love to have you join us! We are staying home and enjoying our friends & family here. I will be travelling to my mom’s house which is about 1 hour away for Christmas. I’ll be staying home for Christmas. We will be staying home for Christmas. All of our family comes to our house for Christmas dinner. We will be traveling to visit our families for Christmas. My husband and I will be hosting our big Christmas family get together this year. I have been busy trying to get ready for it all. Home for Christmas. Nothing better, nothing sweeter. I will be staying home, our families are close by. I will be traveling to my Mom’s for the holidays. I am not yet ready for Christmas. My husband and I will be travelling with my father-in-law to visit some of his side of the family. We will visit my Mom for breakfast on the way back home. Luckily our family lives within 10 minutes of us so we will not be travelling, though part of me wishes we were to somewhere warm and with no snow! I will be stay home this year, hosting the Christmas gala, that my family has. We will be staying home, family will be coming here. I will be staying home and maybe working up until Christmas eve. Most likely no traveling. If we do, it will be about an hour away, nothing too crazy. I’ll be staying home for Christmas. Most of my family lives nearby. Thanks. No travelling. I’m staying home this year. We will be traveling to my Mother’s house this Christmas. I will be going to Vermont to ski with my family! This year, I will be staying home and opening the gifts with my family. I happy to say that we’ll be staying home. No traveling. I’ll just be staying in town.